When you think of Hydrangea, you probably think of a shrub that is between 3- and 5-feet tall and filled with cabbage-size blossoms ranging in color from blue to red. But some hydrangeas grow on single stems just like trees. These hydrangeas may grow slightly taller than shrub varieties. Peegee hydrangea are usually kept small and grow as a single-stemmed shrub, or they are allowed to grow up to 20 feet tall to form a tree. 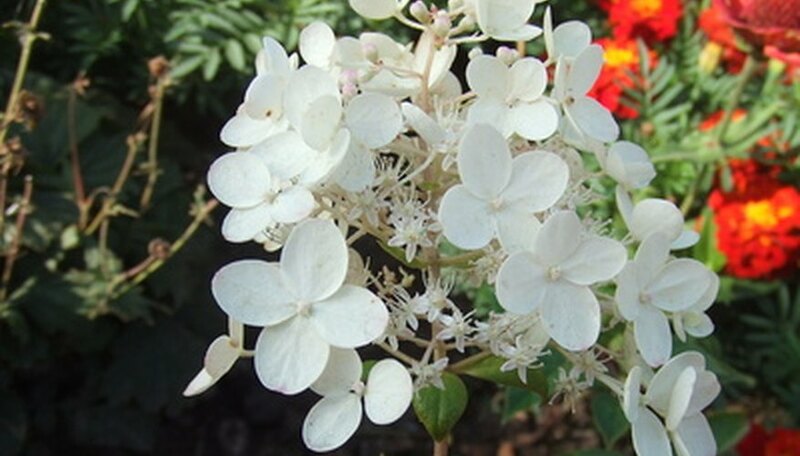 This hydrangea produces large clusters of creamy white flowers that are almost 1-foot long. To prune Peegee Hydrangea, remove weak growth in early spring once all danger of frost has passed. The Kyushu variety of hydrangea is a panicle hydrangea just like Peegee, meaning that the plant produces flower blossoms in panicles, which are cone-like clusters. The flowers are white when the plant first bears them but later turn pinkish-purple with age. Kyushu bears these flowers from late summer into early fall. As a shrub, Kyushu may grow as tall as 15 feet. But if the plant is allowed to grow in tree form, it may reach over 25 feet tall and 10 feet wide. Limelight is a trademarked hybrid hydrangea that has emerged from a grower in Holland in 2007. The plant is named for its bright green cone-shaped clusters of flowers that bloom from midsummer to autumn. Each flower cluster of limelight hydrangeas ranges in length from 6 to 12 inches. Limelight hydrangea blossoms age to a rich, deep pink color. Tardivia Hydrangea adapts well to many soil types. The plant grows equally well in sandy, clay or loamy soil as long as the soil is well drained. The plant is drought tolerant and requires no pruning. Tardiva produces blooms from late July until early fall. The plant's name may come from its 'tardy' bloom time. The blossoms on Tardiva are loose and pointed white clusters that turn purplish-pink with age. Tardiva is the most cold-hardy of the hydrangeas. It will flourish well in zone 3.